Got an adventure planned? Exciting! No doubt, you’ve already put together your basic regalia. Perhaps a wild west poncho or a bull whip and the map to an ancient ruin. Whether you picture yourself recovering lost idols in ancient temples, riding through the old west to the big shootout, or just becoming a famed explorer, there is one accessory that every hero needs to claim in order to secure their win: an iconic hat! This Faux Leather Spanish Hat is just the thing to complement your costume perfectly. Pair it with a poncho for a classic western look, or with a slick jacket to become a famous character. However you picture your costume look, picture it with this hat topping it off to make sure your ensemble is a roaring success! 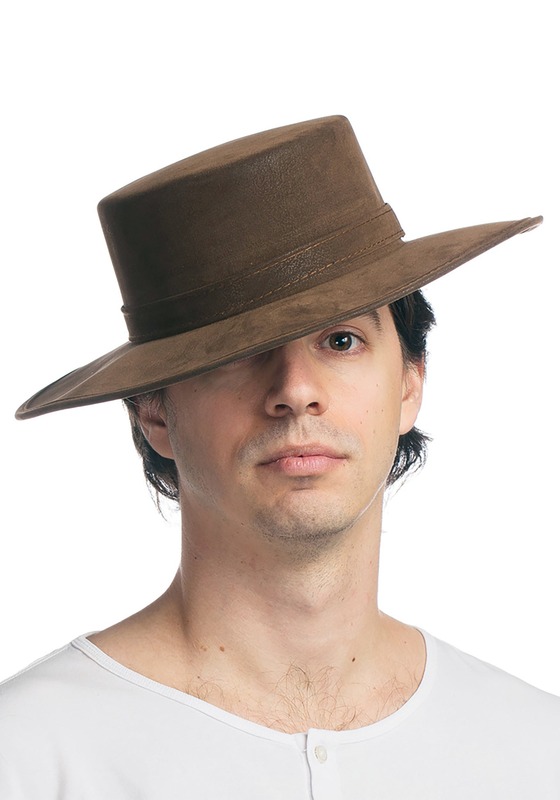 The all polyester faux suede gives this hat its signature touch, along with a matching self-fabric band for a touch of dashing style. One-size-fits-most, you'll be ready for action when you add this signature accessory to your ensemble. Finish the style with this hat, and we're sure any man or woman will be ready for a daring and adventurous costume escapade! Just be sure you don’t forget to grab it when those trap doors start to close!